Trip Report & Review – Cathay Pacific First Class Hong Kong to New York – The Best Service in the Sky??? Part 5 – Trip Report & Review – Cathay Pacific The Wing First Class Lounge – Hong Kong…Cabanas, Tubs, & Ironing! My flight from Hong Kong to New York JFK departed a few hours before it hit New Year’s Eve in Hong Kong, and I headed to the gate about 45 minutes prior to scheduled departure time. Boarding was done on time, and there was a dedicated line for First Class passengers, though it wasn’t obvious. The crowd was organized despite a very full flight, and the Economy line (single file) ended up extending all the way to the next gate. My boarding pass had the dreaded SSSS, so a gate agent accompanied me down the jetway for additional screening. This was my first SSSS experience, and the security agent couldn’t have been nicer. She swabbed my hands, luggage, and invited me to open up all the compartments of my suitcase for inspection. Frankly, it wasn’t too much of a disruption, since all passengers departing Hong Kong for the U.S. get additional screening by the gate for liquids anyway. I settled down at my seat, 1A, and unloaded my bits and pieces to all the compartments found in the seat. Cathay’s First Class seat is one of the widest in the industry, and with the armrest down it felt like I was sitting on a throne. The pitch was generous enough that when the seat wasn’t reclined, my legs couldn’t even reach the ottoman. There were two sets of seat controls: a touch-screen console on the left, and a panel with physical buttons on the right. Tally, one of the First Class flight attendants, came by to offer a pre-departure beverage. There is no better way to start a flight than a glass of Krug champagne, and it was served promptly, poured at the seat. I was also brought the amuse bouche, which was a scallop skewer of some sort. Pao, the other First Class flight attendant, came by to offer pajamas and amenity kit, as a pair of Bose noise-cancelling headphones. I hope know her greeting and true intention just didn’t translate. In all seriousness though, I am someone who has never been able to properly translate Lunar New Year greetings into English, and from her cheery and slightly embarrassed face, I knew it was all just good fun. I only wish I could tell her being rich is definitely not the reason I get to fly First Class! Shortly after takeoff, Pao and Tally came around to get my drink and dinner orders. I had a Cathay Delight, and they brought over some warmed cashews. I later found out that they are both Thai but based in Hong Kong, and they requested to work with each other on the same flight for New Year’s Eve. I liked the camaraderie they had going on, and it made for a more relaxed and chilled but still highly refined cabin service. As they were getting ready for dinner service, Pao and I chatted for a little. Oh boy. That could be interpreted in so many different ways, but I think she really meant well. The slight level of awkwardness at the beginning ultimately proved to be quite an entertaining way to start the flight. Anyway, my table was set, dinner service began, and I found out what Pao meant—for the card that flights attendants handwrite for each First Class passenger, she had a little sticker with her name and Happy New Year on it. First up was the caviar course. As I have described before, Cathay Pacific’s menu are divided into “International Favorites” and “Chinese Favorites,” but passengers can pick and choose items from different sections. On this flight, I went with the entire Chinese menu. The pork soup with carrot and dried pak choy isn’t the most premium sounding or tasting, but it’s a very wholesome offering that was much appreciated. I was looking forward to the cold plate with beef shank and cucumber, but sadly the beef was drenched in sauce, which was itself a tad too sweet. For the main course, I had a steamed cod with preserved mustard greens and Chinese olives, served with steamed jasmine rice, stir-fried pak choy, and carrots. 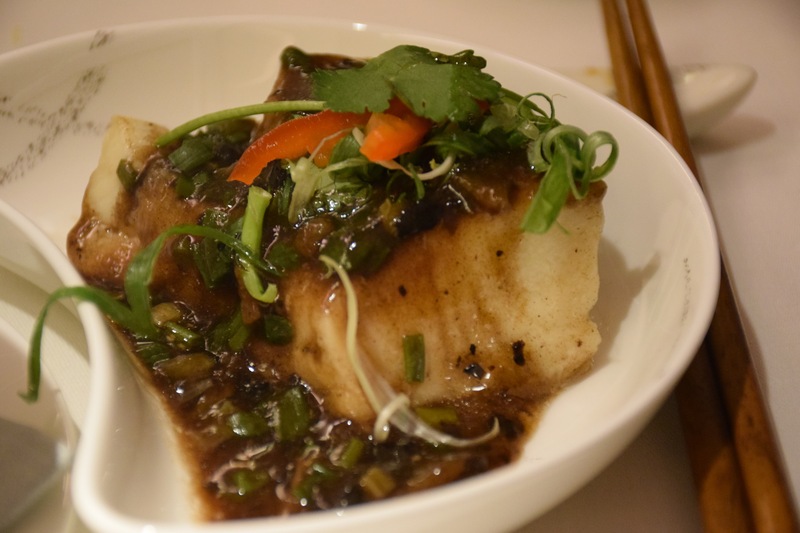 The cod was cooked to perfection, seasoned to just the right amount, and as usual on Cathay, the freshly steamed-on-board rice was a delight as well. To finish, I ordered the fresh berries with rose water syrup. 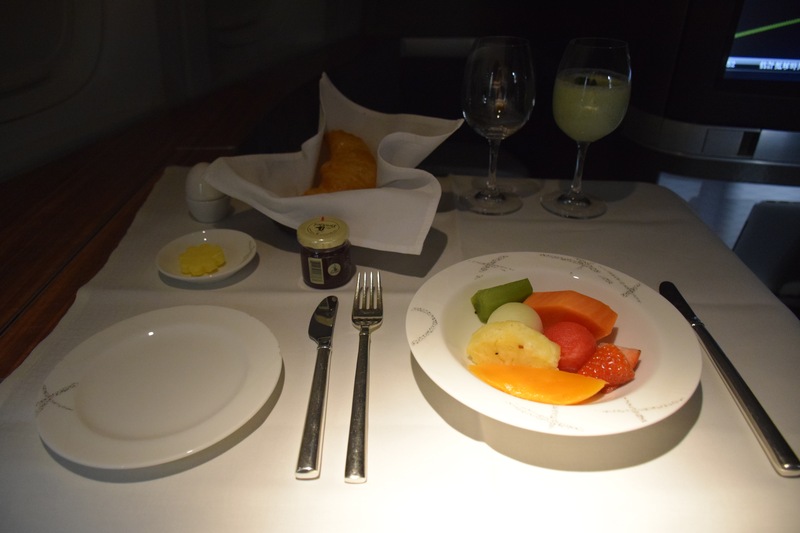 The berries were amazingly fresh, and not just for being served on a plane, but in general. The rose water syrup was light, not overly saccharin, and accompanied the berries very well. After dinner, I changed into my pajamas while my bed was made. Cathay Pacific’s bedding is one of the best I have experienced, and I was able to snooze for a good 6 hours. A little over half way through the flight, I decided to order something to eat. The snack menu was extensive, and included items from Häagen-Dazs ice cream to a full fledge burger. I ordered a Japanese braised pork in ramen noodle soup, which was very delicious. Though passengers had the option to dine whenever they wanted, I chose to have “breakfast” (or rather, dinner in Eastern time) about 2 hours prior to landing, and it seemed like the rest of the cabin did too. For breakfast, I had some fresh fruit and a croissant to start. As the main course, it’s really hard to go wrong with the freshly prepared organic free range eggs. Cathay Pacific makes pretty darn good scrambled eggs with their skillet on board, and I selected Dingley Dell bacon, Cumberland sausage, and Roma tomatoes to go with it. I was still a bit hungry, so I ordered the Hong Kong style egg tart from the snack menu. Unfortunately, the seatbelt sign came on just as the egg tart was ready, and Cathay Pacific does not serve hot liquid when the seatbelt sign is on. Now, I would argue that the egg tart really shouldn’t count as a liquid, but I wasn’t going to make a big fuss. Tally was extremely apologetic though. 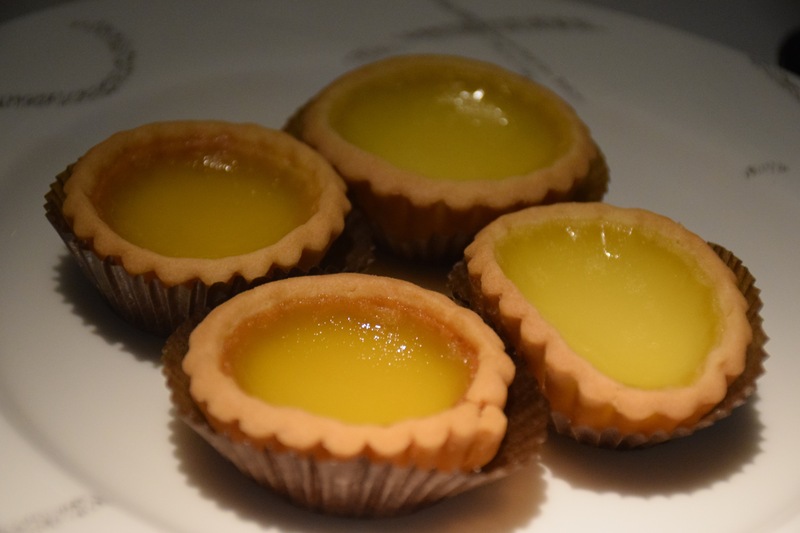 Anyway, about 25 minutes later, the seatbelt sign finally went off, and the crew doubled my egg tart serving. Can you tell which ones got left in the oven for a little too long? My flight landed at JFK a littler after 10 pm, and in order to avoid the crazy crowd that’s the NYE Countdown bunch, I booked it out of the plane, ran up to the AirTrain, ran towards Jamaica Station, took the Long Island Railroad, got into Penn Station right at 11 pm, just in time to catch my Amtrak train to Philadelphia. I “counted down” to 2015 on an essentially empty Amtrak train. Some people thought it was pretty sad, but to me…counting down to 2015? Meh. Been there, done that. With free flowing Krug. Overall, judging by my three flights in Cathay Pacific First Class, I have found the crew to be amazingly consistent—always courteous, always smiling, and always refined without being robotic. In terms of food, their main dishes are not the most exciting, but they are delicious and get the job done. Their extensive snack menus offer substantial choices and are sometimes even more exciting than the main menu! In short, there is simply no better way to fly First Class direct from New York to Hong Kong. I hope you enjoyed this series of all-Cathay trip reports! Pretty tight conection to Amtrak, no? What was your back up plan if the flight arrived late? Ha! To tell you the truth, I didn’t have a back up plan…I was banking on Global Entry and CX being on time.